When you purchase any of the Adobe CS4 suites and register the product, Adobe gives you a free gift. Incentive to register, I suppose. They had done this in prior versions (I believe starting with CS3-I could be wrong), but they offered fewer options last time around and I ended up choosing a free Adobe font set. Over the past year I had decided one can indeed have too many fonts, so when prompted to choose my free gift after installing and registering CS4 Master Collection, I chose the two free copies of Layers magazine. What a great opportunity to get some professional introduction to the new tools and features in CS4, right? Wrong. And really, there are three problems compounded here. 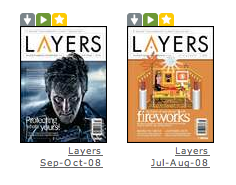 First, the Layers issues which I was emailed (see problem number two) were for July/August (four months old) and September/October (two months old).Â Why give away two issues of a magazine so old that they can't contain any CS4 information? How does this benefit users for the new software they just paid well over $2,000 to purchase? I understand some people might get upset that they didn't get their free gift right away and they have to wait up to two months for the next issue to be released, but they did choose a magazine. And I'd say it is fair to assume that people know they will be waiting for the latest issue to arrive if they choose to order a magazine. Either way, it took Layers (or Adobe) about 3 weeks to even send me an email to "pick up" my digital copies... which were up to four months old. This leads me to my second point. 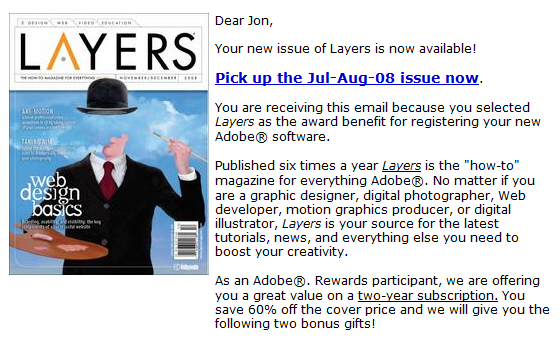 Second, I received an email from Layers and Adobe saying that my two free issues of Layers were "now available" and I should "pick up the Jul-Aug-08 issue now". Reading through the email it is more trying to get me to subscribe to a fairly expensive magazine (even with the 60% discount) then anything else, but clicking on the pick up link takes you to a third-party digital delivery provider. When I got to the site I was fairly annoyed. If I chose to get a magazine as my free gift, why am I being provided a digital copy? I suppose I missed something when choosing my gift that notified me it would be a digital "download"? Even saying it is a "download" is incorrect, because as far as I can tell you can only view it online and when connected to the internet, without resorting to some hackery anyways. Third, once I did "download" my digital copies, I was even more surprised to find that they contained no CS4 content, but rather all old CS3 content. 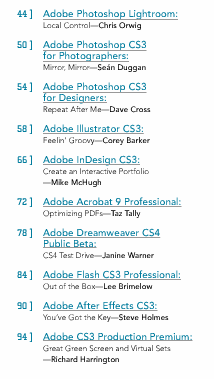 So much for that introduction to the new tools and features in CS4 I was hoping for. A table of contents from the 'latest' issue is at the right. All in all, I probably would have been better off taking the free fonts. Don't make the same mistake I did. Haven’t decided, yet, but I’m leaning towards the 30 day Safari trial – thanks for making the decision a bit simpler..
Well, at least you guys are getting the confirmation email linking to the free gift. I chatted via web with an Adobe rep, stating that I had not received the free gift email – I was told he sent the email again. Then I got an email about my case being closed, but have yet to get the one allowing me to select a free gift… What font is offered? Dude, I read this post a long time ago, right after CS4 had come out and I didn’t receive my copies of the magazines. I happened to register Acrobat yesterday and got another Free Gift email. This time, Layers Magazine wasn’t an option, but instead had been replaced with a font named Hypatia Sans. Next to the description of the font is an image of an unknown (to me) CS4 logo, which makes me think, “oh, sweet! The CS3/4 Icon font!” Sounds good, right? Well, that’s where I was wrong. Not only was it NOT the logo/icon font, it wasn’t even clean and usable. I downloaded the font, tried to use it in Photoshop, and noticed it was a little aliased and jaggy. I tried it in Flash. Same result. I tried it in Illustrator. Nothing doing. I hope I’m just missing something. I also received an email to register my qualifying product with Adobe through the program itself (my qualifing program was PS CS4) and receive my choice of a “free” gift. Choices were a font, training, etc. I wanted the font. When I recevied no response, I registered again; thinking maybe it did not go through the 1st time. Still nothing. (And Adobe emails have never gone into my spam folder; BUT I did check every day to make sure it did NOT go there.) I opned up a customer service case; it was closed with the answer I did not have paid technical support. I called customer service; they said they would email me the link. Nothing. Open another customer service case; it was closed as “resolved”. Called customer Service AGAIN, AGAIN they said they would email it. NOTHING. Yet I am still receiving other emails from Adobe. I am at my wits end; I am SO frustrated. Any ideas?